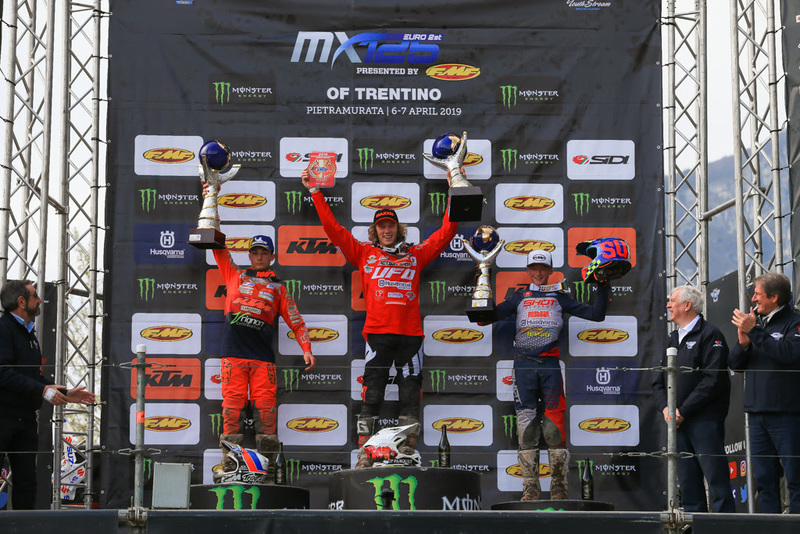 The second rounds of the 2019 EMX250 and EMX125 presented by FMF Racing Championships took place this weekend at the Trentino circuit where Italy’s own Alberto Forato and Mattia Guadagnini from Maddii Racing Husqvarna took the respective wins. 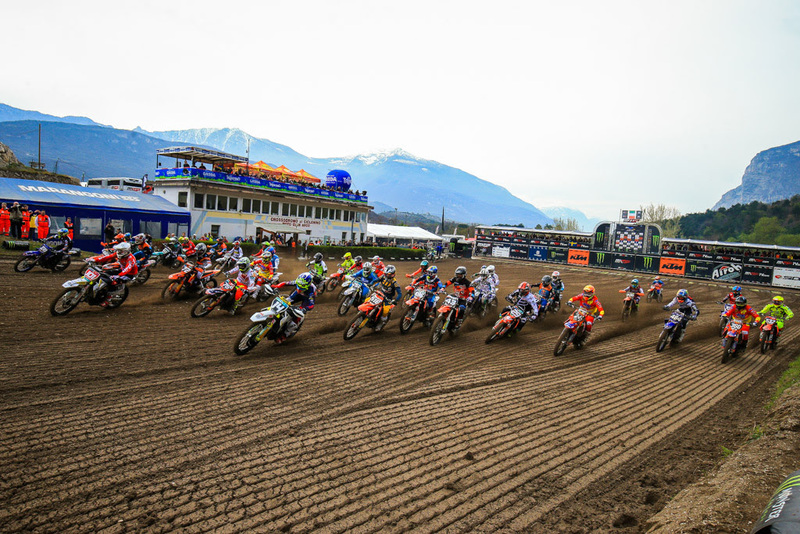 The round of Trentino is always one of the best attended by fans and riders due to not only Italy’s passion for motocross but also the incredible venue, its surroundings, and unique circuit. This weekend the two FIM EuropeChampionships had a combined list of 193 entries. Saturday sessions split the classes into two further groups where only the top 20 of each qualified to line up in the Championship points paying races. Once the qualifying practice was completed 40 riders made the starting list in each class and lined up for the first races of their 2 day, 2 race format. EMX250 Race 1 on Saturday started in dramatic fashion as riders piled up in both the first and second turn. Creymert Racing’s Kevin Horgmocame away unscathed and held the lead early but Honda Redmoto Assomotor’s Stephen Rubini moved to the premiere positionin the second lap. Rubini led the way while the championship leader, Maddii Racing Husqvarna’sAlberto Forato, was back in around 4th. Forato made passes on both Rubini’s Honda Redmoto Assomotorteammate Pierre Goupillonand Horgmo to get into 2nd. Horgmo fought the Italian back and led the next lap across the finish but then returned to 3rd another lap later. Forato was in pursuit of the lead and Rubini until the Frenchman lost the lead on his own accord. Forato graciously accepted the gifted lead and never looked back taking the win by 11.6 seconds over Rubini. Horgmo took 3rd while Goupillon and Ghidinelli Racing Team’s Giuseppe Tropepe rounded out the top 5. Today’s race 2 was led by Rubini after the start but he had Forato making quick passes behind him to apply pressure from 2nd. On the 2nd official lap Rubini was passed down the Pit Lane straight parallel to the start by Forato to the home crowd’s cheers but Forato then fell handing Rubini the lead straight back. Forato got back up and immediately went back to work seemingly unphased taking the lead role back by the next time across the finish. Goupillon was watching the battle for the lead from slightly further behind in before eventually getting passed by Tropepe for 3rd position. At the finish Forato carried on his dominant and perfect season with his 4th race win in 4 races and second overall. Rubini finish both second in the race and 2ndoverall while Tropepe took the final podium spot. EMX250 Race 1 Top Ten: 1. Alberto Forato (ITA, Husqvarna), 30:15.591; 2. Stephen Rubini (FRA, Honda), +0:11.692; 3. Kevin Horgmo (NOR, KTM), +0:26.792; 4. Pierre Goupillon (FRA, Honda), +0:34.926; 5. Giuseppe Tropepe (ITA, Yamaha), +0:48.032; 6. Roan Van De Moosdijk (NED, Kawasaki), +0:50.926; 7. Ruben Fernandez (ESP, Yamaha), +0:52.092; 8. Rene Hofer (AUT, KTM), +0:53.722; 9. Karlis Sabulis (LAT, KTM), +1:20.842; 10. Glen Meier (DEN, Yamaha), +1:27.355. EMX250 Race 2 Top Ten: 1. Alberto Forato (ITA, Husqvarna), 30:07.114; 2. 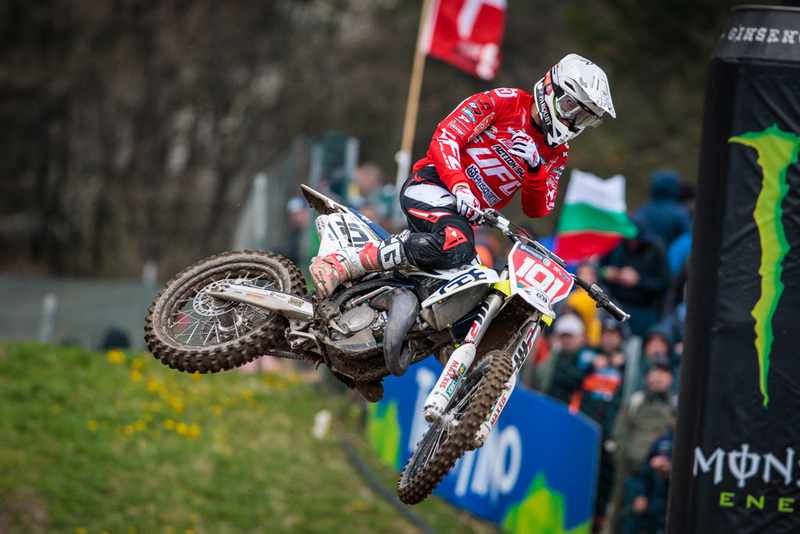 Stephen Rubini (FRA, Honda), +0:14.401; 3. Giuseppe Tropepe (ITA, Yamaha), +0:28.263; 4. Rene Hofer (AUT, KTM), +0:30.271; 5. Karlis Sabulis (LAT, KTM), +0:31.021; 6. Pierre Goupillon (FRA, Honda), +0:42.814; 7. Ruben Fernandez (ESP, Yamaha), +0:46.869; 8. Roan Van De Moosdijk (NED, Kawasaki), +0:50.282; 9. Thibault Benistant (FRA, Yamaha), +0:50.624; 10. Kevin Horgmo (NOR, KTM), +0:55.110. EMX250 Overall Top Ten: 1. Alberto Forato (ITA, HUS), 50 points; 2. Stephen Rubini (FRA, HON), 44 p.; 3. Giuseppe Tropepe (ITA, YAM), 36 p.; 4. Pierre Goupillon (FRA, HON), 33 p.; 5. Rene Hofer (AUT, KTM), 31 p.; 6. Kevin Horgmo (NOR, KTM), 31 p.; 7. Karlis Sabulis (LAT, KTM), 28 p.; 8. Ruben Fernandez (ESP, YAM), 28 p.; 9. Roan Van De Moosdijk (NED, KAW), 28 p.10. Thibault Benistant (FRA, YAM), 18 p.
EMX250 Championship Top Ten: 1. Alberto Forato (ITA, HUS), 100 points; 2. Stephen Rubini (FRA, HON), 80 p.; 3. Pierre Goupillon (FRA, HON), 67 p.; 4. Roan Van De Moosdijk (NED, KAW), 63 p.; 5. Rene Hofer (AUT, KTM), 59 p.; 6. Ruben Fernandez (ESP, YAM), 57 p.; 7. Kevin Horgmo (NOR, KTM), 53 p.; 8. Giuseppe Tropepe (ITA, YAM), 51 p.; 9. Karlis Sabulis (LAT, KTM), 50 p.; 10. Josh Gilbert (GBR, HON), 33 p.
EMX125 presented by FMF Racing was clear cut with Maddii Racing Husqvarna’s Mattia Guadagnini leading every single one of the 15 laps. F4E Racing KTM’s Guillem Farres Plaza was the closest to Guadagnini as he ran in 2ndfor the first 7 laps. Team VRT KTM’s Tom Guyon was the man on a mission however as he came from 7thto take over Plaza’s 2ndposition at the halfway point. 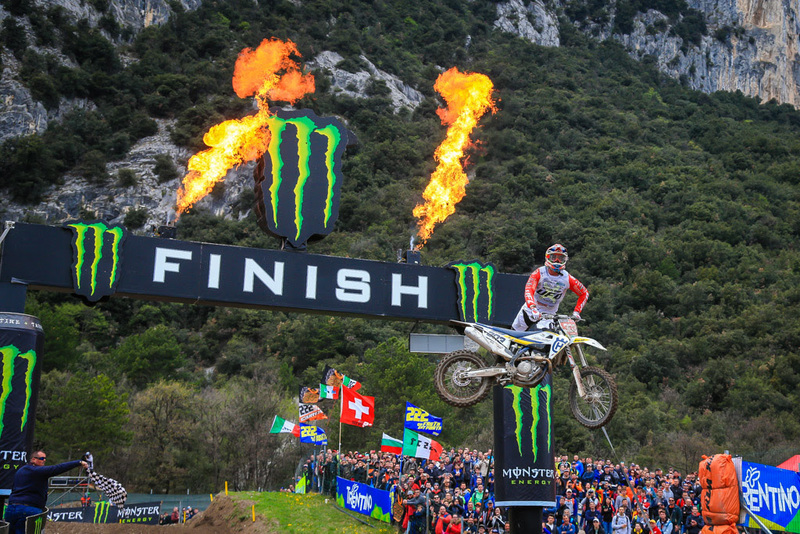 Rockstar Energy Husqvarna Factory Racing’s Kay de Wolf was third until Guyon passed him on the way to 2nd. When the checkered flag went out Guadagnini was the winner followed by Guyon, Plaza, De Wolf, and A1M Husqvarna’s Jorgen-Matthias Talviku. Today the sound of two strokes brought life to the circuit for race 2 as the first event on track. The earlier winner, Guadagnini was off to another dominant performance, leading the first laps of race 2 ahead of De Wolf and WZ-Racing’s Simon Laengenfelder. Laengenfelder got up to 2nd position with De Wolf dropping to third ahead of Guyon who went past both the next lap. Just as quickly as the #516 WZ-Racing machine slotted into 2nd it was shuffled back to 4thbefore returning to 3rd another lap later. For the final 6 laps each of the rider in the top 7 held their positions meaning that Guadagnini scored the overall with 1-1 finishes and he extended his points lead in front of the home fans. Guyon and De Wolf meanwhile rounded out the podium going 2-2 and 3-3 respectively. EMX125 Presented by FMF Racing Race 1 Top Ten: 1. Mattia Guadagnini (ITA, Husqvarna), 29:31.651; 2. Tom Guyon (FRA, KTM), +0:16.826; 3. Guillem Farres Plaza (ESP, KTM), +0:30.844; 4. Kay de Wolf (NED, Husqvarna), +0:31.589; 5. Jorgen-Matthias Talviku (EST, Husqvarna), +0:42.140; 6. Alberto Barcella (ITA, KTM), +0:46.672; 7. Liam Everts (BEL, KTM), +0:49.752; 8. Mike Gwerder (SUI, KTM), +0:52.262; 9. Matias Vesterinen (FIN, KTM), +0:59.026; 10. Oriol Oliver (ESP, KTM), +1:09.909. EMX125 Presented by FMF Racing Race 2 Top Ten: 1. Mattia Guadagnini (ITA, Husqvarna), 30:30.551; 2. Tom Guyon (FRA, KTM), +0:13.130; 3. Simon Laengenfelder (GER, KTM), +0:34.731; 4. Kay de Wolf (NED, Husqvarna), +0:43.342; 5. Oriol Oliver (ESP, KTM), +0:44.162; 6. Jorgen-Matthias Talviku (EST, Husqvarna), +1:01.060; 7. Matias Vesterinen (FIN, KTM), +1:07.721; 8. Guillem Farres Plaza (ESP, KTM), +1:09.067; 9. Alberto Barcella (ITA, KTM), +1:15.010; 10. Andrea Bonacorsi (ITA, KTM), +1:15.781. EMX125 Presented by FMF Racing Overall Top Ten: 1. Mattia Guadagnini (ITA, HUS), 50 points; 2. Tom Guyon (FRA, KTM), 44 p.; 3. Kay de Wolf (NED, HUS), 36 p.; 4. Guillem Farres Plaza (ESP, KTM), 33 p.; 5. Jorgen-Matthias Talviku (EST, HUS), 31 p.; 6. Oriol Oliver (ESP, KTM), 27 p.; 7. Alberto Barcella (ITA, KTM), 27 p.; 8. Matias Vesterinen (FIN, KTM), 26 p.; 9. Liam Everts (BEL, KTM), 24 p.; 10. Mike Gwerder (SUI, KTM), 22 p.
EMX125 Presented by FMF Racing ChampionshipTop Ten: 1. Mattia Guadagnini (ITA, HUS), 93 points; 2. Tom Guyon (FRA, KTM), 83 p.; 3. Kay de Wolf (NED, HUS), 74 p.; 4. Jorgen-Matthias Talviku (EST, HUS), 73 p.; 5. Oriol Oliver (ESP, KTM), 61 p.; 6. Mike Gwerder (SUI, KTM), 48 p.; 7. Guillem Farres Plaza (ESP, KTM), 43 p.; 8. Simon Laengenfelder (GER, KTM), 40 p.; 9. Liam Everts (BEL, KTM), 37 p.; 10. Alessandro Facca (ITA, KTM), 30 p.
EMX125 Presented by FMF Racing Manufacturers: 1. Husqvarna, 97 points; 2. KTM, 89 p.; 3. 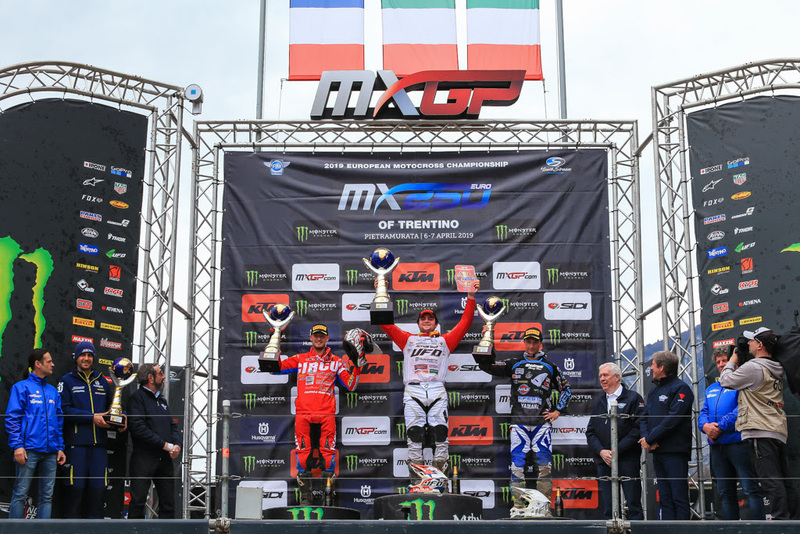 Yamaha, 26 p.
The next round of the EMX125 Presented by FMF Racing championship will take place on May the 12th in Mantova during the Monster Energy MXGP of Lombardia while the next round of the EMX250 Championship will be held in St.Jean d’Angley, France on May the 26th.